Carolina Environmental Conference. 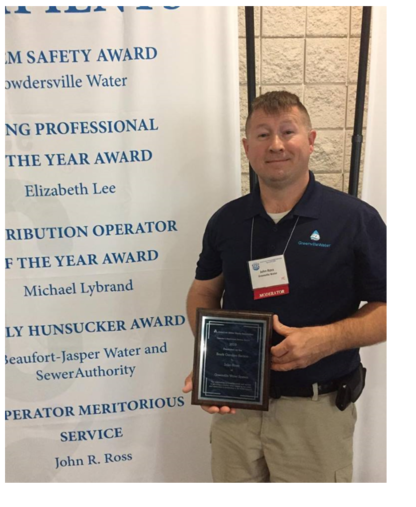 This award is given to a Water Treatment Operator who has demonstrated outstanding performance based on health department standards and excellence in operation and maintenance. John began his career 24 years ago with Greenville Water as a Filter Plant Operator trainee at the Adkins Water Treatment Plant. Living just across the street, John was approached by a former plant superintendent, who asked if he wanted a job. He quickly learned the treatment process and achieved an “A” Water Plant Operators License within his first four years. In 2014, he was promoted to Lead Operator, followed by a 2016 promotion to Chief Operator, which provided an opportunity for him to manage, plan and facilitate day-to-day plant operations. Shortly thereafter, he was promoted to Plant Superintendent. John received his Associate’s Degree from Tri-County Technical College, majoring in Welding, as well as, a minor in hydraulics and pneumatics in 1995. “John’s outstanding contributions assured that health and safety standards mandated by regulatory requirements were not only met but were exceeded. We are proud to have dedicated employees like John, and we congratulate him on this prestigious recognition,” said David Bereskin Chief Executive Officer.